Stack ‘em up and knock ‘em down! This classic game includes 10 “cans” and 6 balls. Rubber foam construction allows players to hit the targets without making noise. 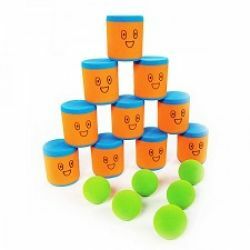 Set includes 10 cans, 3.15”W x 4”H and 6 balls 2.5” W.